SUGAR LAND, TEXAS (May 26, 2017) The No. 3 Sam Houston State Bearkats punched their ticket to the championship game of the 2017 Southland Conference baseball tournament with a 7-1 win over No. 7 New Orleans at Constellation Field in Sugar Land on Saturday afternoon, May 26, 2017. The Bearkats shut out the Privateers until the eighth inning, when they were able to score their only run of the game. Sam Houston score two runs in both the second and sixth innings, and added three insurance runs to seal the game and advance to Saturday’s final. First baseman Blake Chisolm continued his stellar performance in the tournament, going 3-for-4 at the plate with three runs, two RBI and raising his batting average to .370. Catcher Robie Rojas scored two runs while adding an RBI to his season total. Riley Cooper, pitching 2.2 innings in relief, received the win, his first of the season. New Orleans starter Hunter Medine was credited with the loss, giving up two runs on six hit in four innings either Houston Baptist or Central Arkansas in Saturday’s final with a scheduled 6 p.m. start. SUGAR LAND, TEXAS (May 26, 2017) The No. 4 Houston Baptist University Huskies rallied from a two-run deficit in the top of the first inning to down the No. 1 McNeese StateCowboys by the score of 5-4 in an elimination game for both schools in the 2017 Southland Conference Baseball Tournament. The very vocal fans at Constellation Field on Friday, May 26, 2017, saw the Huskies score one run in the second innings and two additional runs in both the third and fourth innings to put the game away and advance to a 7 p.m. game against No. 5 Central Arkansas. The nightcap game will also be a must win for HBU, having lost to the Bears 15-4 in the first round of the tournament on Wednesday, May 24. The Huskies and Bears have faced each other four times previously this season, including the first-round matchup on Wednesday. The Bears took the first and last game of the three-game series by the scores of 4-3 and 17-4. HBU won the middle game, 5-3, on April 8 on their home field. McNeese won their first game on the tournament over No. 8 Lamar (7-5), before dropping their second game of the tournament, 5-3 to Central Arkansas. HBU scored their five runs off 10 hits, including a home run by shortstop Tyler Depreta-Johnson; his second of the season. First baseman Jake Pulcheon was 2-for-4, with two RBI, while designated hotter Christian Thamas was 2-for-3 with one run. Starter Daniel Endsley received his third win of the season; pitching 8.1 innings. Zach Carter, pitching 2/3 of an innings in relief, was credited with the save. gainst Sky Blue midfielder Sarah Killion (16). HOUSTON, TEXAS (May 13, 2017) The Houston Dash seemed stymied by the Sky Blue FC offense and dropped a 3-1 decision to their NWSL opponent at BBVA Compass Stadium in Houston on Saturday, May 13, 2017. 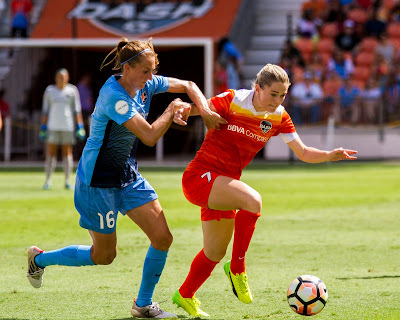 With the loss, the Dash drop to 2-3-0 in 2017 and extend their winless streak against Sky Blue which goes back to August 9, 2014 The only win Houston has against Sky Blue is a 3-0 decision on June 8, 2014, in their first-ever match against each other. Dash head coach Randy Waldrum’ record at home dropped to12-18-5, while the Dash drop to 1-5-3 against Sky Blue. Sky Blue got one the scoreboard in the 33rd minute when Sarah Killion converted a penalty kick. They added an insurance goal in the 52nd minute by Leah Galton and in the 87th minute by Samantha Kerr. Houston single goal came in the 76th minute by Poliana. With her goal, Poliana moves into the top spot in goals for the Dash, tied with Kealia Ohai with two. Ohau talked about the Dash loss after the game. Head coach Randy Waldrum also talked about the outcome of the game. A noticeable absence on the pitch was Houston midfielder Denise O’Sullivan. She was listed as a probable starter prior to the game, but was not listed in the pregame lineup. The Cork, Ireland native has started in four game this season, totaling 297 minutes, and tallying one assist, two shots on target , and committing eight fouls. HOUSTON, TEXAS (May 12, 2017) Connecticut freshmen Cameron Thompson connected for a throw of 60.23 meters (197 feet, 7 inches) to win his first-ever conference title in the hammer throw at the American Athletic Conference Track and Field Championships at the Tom Tellez Track on the campus of the University of Houston. In the first day of competition (May 12, 2017), his winning throw can on his third attempt, but unfortunately, was shorter than his conference-leading mark of 60.67 meters (199 feet, 0 inches). Thompson was followed in the standings by fellow freshmen Aleks Rapp in second place with a throw of 59.0 meters (193 feet, 10 inches) and the third-place performance of Houston senior Damon Thompson (58.71 meters; 192 feet, 7 inches). The East Carolina Pirates picked up fourth and fifth place with the efforts of Adam Manns (57.81 meters; 189 feet, 8 inches) and Ryan Davis (55.87 meters; 83 feet 4 inches). South Florida placed sixth and seventh, with East Carolina scoring the eight place points. In running action, UConn’s Emily Durgon took top honors in the women’s 10,000-meter run. The senior broke her own meet record with the time of 34:28.06. The previous record of 34:30.49 was set at the conference meet in 2015. UCF’s Anne-Marie Blaney took the silver medal (34:31.42) while SMU’s Hannah Miller snagged the bronze (34:47.28). In the men’s 10,000 meter run, Tulsa went 1-2 with Henry Pearce taking the gold and Adam Roderique the silver. East Carolina’s Jorge Montes grabbed the bronze. 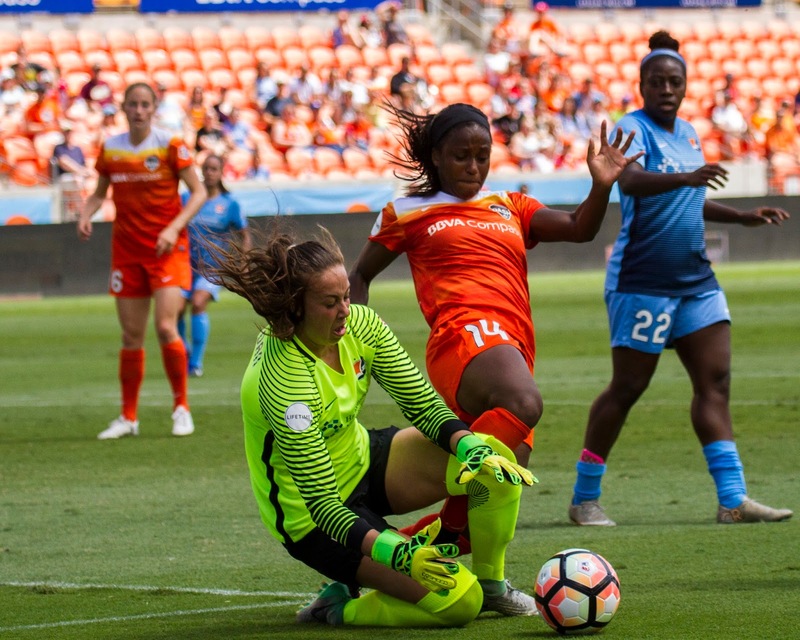 The championships continue on Saturday with field events at 3 p.m. and running events at 5:30 p.m.
HOUSTON, TEXAS (May 12, 2017) The Houston Dynamo jumped to the top of the Western Conference standings on Friday night (May 12) with a 2-1 win over Vancouver Whitecaps FC at BBVA Compass Stadium. The win kept Houston undefeated at home this year and improve their home record to 6-0-1. It also allowed them to surpass the team’s total wins at home from 2016. The Dynamo went 5-5-7 a year ago at BBVA Compass Stadium. Erick Torres (shown left, No. 9) doubled the Dynamo’s score when he converted a penalty kick in the 67th minute. His eight goals on the season are the second-most in his career, behind a 15-goal season in 2013. The score was his league-leading eighth goal of the season along with his third game-winning goal of the season. 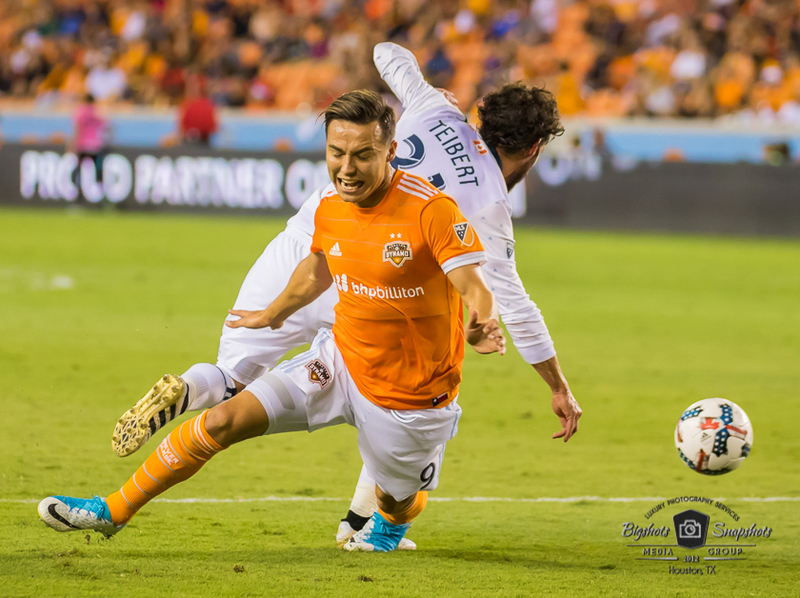 The goal was Torres’ fourth from a penalty kick this season, which is the most in a single season in Dynamo history. Brad Davis had three penalty kick goals in 2010, 2011 and 2012. 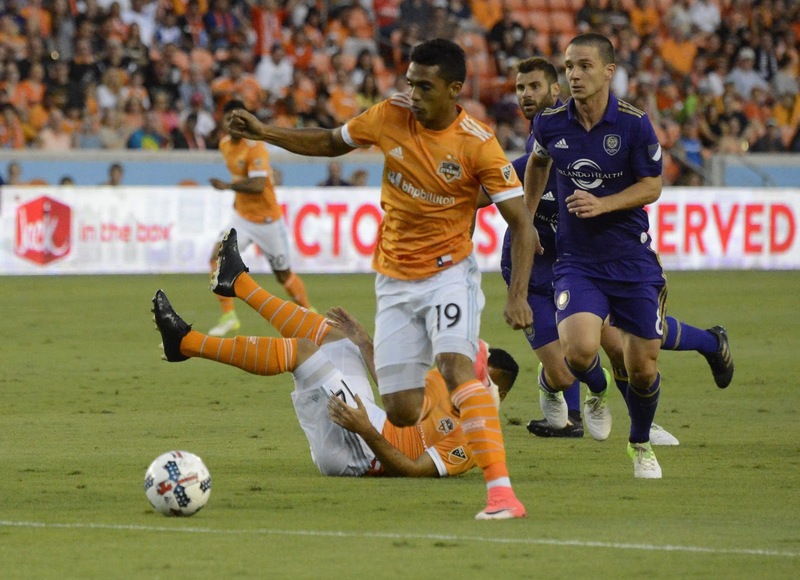 Torres talked with the press, after the match, about the Dynamo’s home-game success in 2017. “We have validated our home stature, the fan base has supported us and that made the opponent feel uncomfortable. Now we have to get points on the road, play with the same intensity, have personality, have the same attitude, character that we demonstrate. That way we will be able to get points on the road because we have a streak of away matches and we have to get points." Brek Shae came off the bench and scored for the second consecutive week for Vancouver in the 85th minute to close out the scoring for the evening. HOUSTON, TEXAS (May 12, 2017) Cincinnati’s Annette Echikumwoke completed only two legal throws, but her second throw of 60.97 meters (200 feet 0 inches) in the women’s hammer was good enough to win the first event of the 2017 American Athletic Conference Championships on Friday, May 12, 2017. The competition is being held on the Tom Tellez Track on the campus of the University of Houston will run through Sunday, May 14. Her winning thrown was short of her season best of 63.91 meters (208 feet, 8 inches) from April 15 of this year and broke her own meet record established at last year’s championships. In second place was UCF’s Chelsea Gobourne with a throw of 59.45 meters (195 feet, 0 inches). Two Houston Cougar sophomores followed in the standings, with Mikaila Martin earning her place on the victory platform with a throw of 59.44 meters (195 feet, 0 inches). Teammate Taylor Scaife placed fourth at 59.10 meters (193 feet, 11 inches). Connecticut picked up fifth place points, followed by UCF in sixth, South Florida in seventh, and East Carolina in eighth. With their third and fourth place finish, Houston is tied with UCF for the lead in the team standing with 11 points. The finals in the men’s hammer, along with the women’s and men’s 10,000-meters will also be contested on Friday evening. Joe Benson (5) to advance to second base. SUGAR LAND, TEXAS (May 7, 2017) The Sugar Land Skeeters tallied three euns in the fourth inning to take a 6-1 victory over the New Britian Bees at Constellation Field in Sugar Land, Texas on Sunday, May 7, 2017. 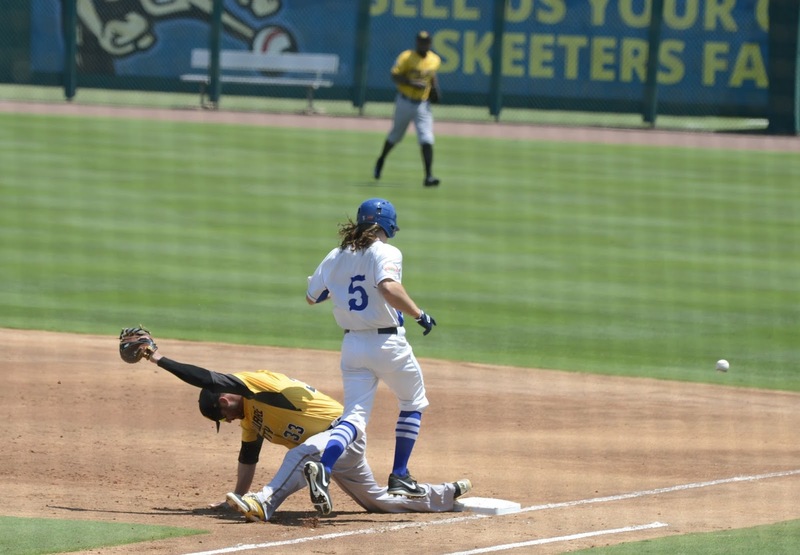 The Skeeters jumped on the scoreboard in the first inning when third baseman Lance Zawadzki singled on a 0-1 pitch, scoring shortstop Josh Prince. They added a second run in the second inning when second baseman Anthony Giansanti hit a sacrifice fly to center field to score designated hitter Andy Wilkins from second base. Prince added to the scoring assault when he cleared the bases on a double, to send three runs home to take the score to 5-0 in the fourth inning. The Bees finally got on the board in the eighth inning. Sugar Land countered in the bottom of the inning with a Derrek Miller single, sending Wilkins home for the final score of the game. of La Vita Loca Photography, click here. Last season, the Skeeters had their share of troubles against the Bees. In New Britian's first season in the Atlantic League, Sugar Land was 7-13 overall, 3-7 at home, and 4-6 at New Britian. In Friday's game, Sugar Land downed the Bees 7-5 and followed up with a 3-2 win on Saturday. The current series will continue on Monday, May 8 with a 7:05 p.m. CT start. HOUSTON, TEXAS (May 6, 2017) Mauro Manatos scored goals in both the first and second half to secure a 4-0 win for the Houston Dynamo over Orlando City FC at BBVA Compass Stadium. The 8,000-plus fans in attendance saw the Sabanalarga, Columbia native triple his season goal to give Houston three-needed points and push their record to 5-3-1 and 16 points. 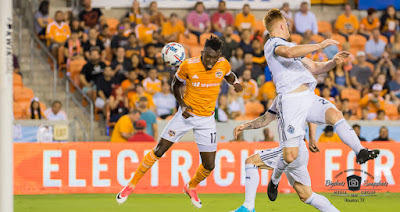 The first goal of the game came in the 23rd minute when Houston forward Alberth Elis nailed a shot past Orlando goalkeeper Joseph Bendick for his fourth goal for the season. The Manatos added the insurance goals in the 51st and 65th minute. The goals were the second and third scores of the season for the 21-year-old. Romell Quito added to the Dynamo scoring assault in the 75th minute. It was the fourth goal of the season for the 25-year-old forward. The four goals in the game are the most this season for Houston, and their largest score differential since their 5-0 win over FC Dallas on March 12, 2016. To view the slideshow from the game by Darla Tamulitis of La Vita Loca Photography, [please click here. finisher in the 2017 Cap 2K Open Water Race. 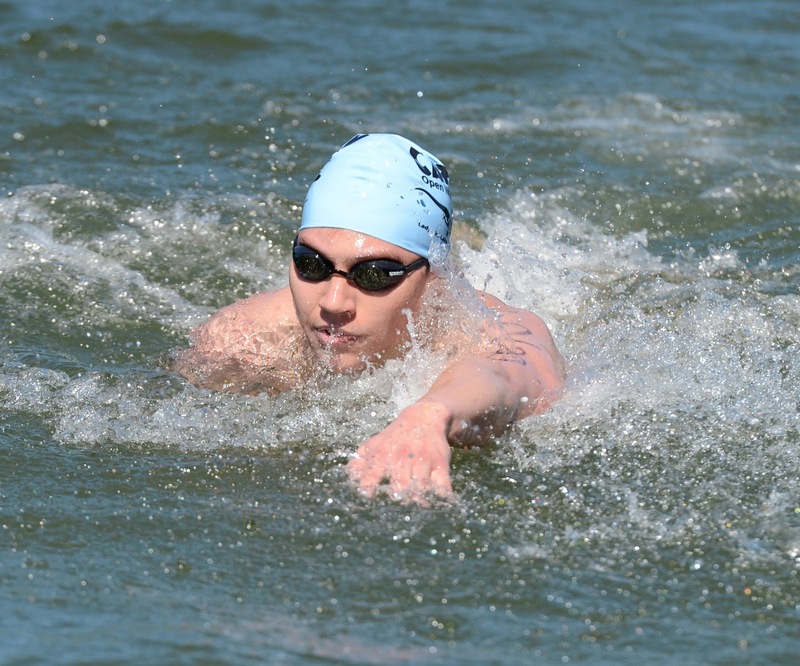 AUSTIN, TEXAS (May 1, 2017) Nineteen-year-old Jacob Hurrell-Zitelman and 17-year-old Morgan Johnson were the top male and female finishers in the 15th Annual Cap 2K Open Water Race in Austin, Texas on Sunday, April 30, 2017. Hurrell-Zitelman finished the two-kilometer course in 23 minutes, 43.88 seconds, which was eight seconds ahead of second place finisher Clark Wakeman. Jacob Hurrell-Zitelman swims collegiately for Trinity University in San Antonio and was a triple gold medalist in the 2017 Southern Collegiate Atlantic Conference Championships in the 500-yard freestyle (4:36.25), 400-yard individual medley (4:04.764) and 1,650-yard freestyle (15:54.58). The 2016 graduate of San Antonio Taft High School also competed in the 2017 NCAA Division III Swimming and Diving Championships in the 500-yard, 100-yard, and 1.650-yard freestyle along with the 400-yard individual medley. Wakeman's second place time was 23 minutes, 51.82 second with 27-year-old Nolan Slesnick placing third (24:02.15). In the female division, 17-year-old Morgan Johnson was the top finisher with the time of 25 minutes, 2.37 seconds. Her performance was also the fourth overall best time in the race. Fisishing in second place in the female division was 16-year-old Halle Gordon (27:34.52) with 14-year-old Erin Lin (27:48.02) taking third. In the First Responder division, William Hanson placed first with the time of 37 minutes, 57.19 seconds. Sybil Hay was second with the time of 47 minutes, 54,60 seconds. Cap 2K co-race organizer and founder Keith Bell was second in the men's 65-69-year-old division with the time of 31 minutes, 49.74 seconds. His performance was also 30th overall in the field of 185 competitors. He is the only swimmer to have competed in all 15 Cap 2K Races, whom he runs and organizes with his wife, Sandy Neilson-Bell. Neilson-Bell was a triple gold medalist (100-meter freestyle, 400 meter freestyle relay, 400-meter medley relay) in the 1972 Olympic Summer Games in Munich. 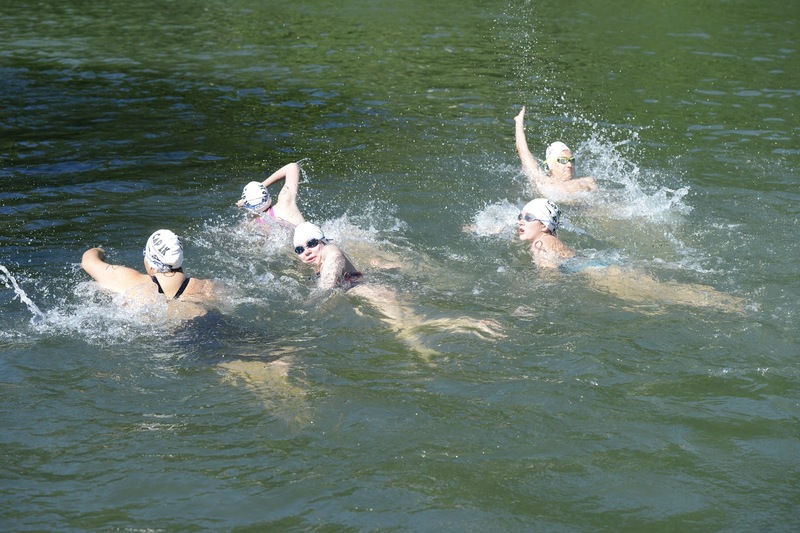 The 16th edition of the Cap 2K is scheduled for Sunday, April 29, 2018.
in the Cap 2K Open Water Race. Photo by Darla S Tamuitis. AUSTIN, TEXAS (May 1, 2017) Four members of the South Belt Area "All Stars" Swimming Team (SBAS) competed in the Cap 2K Open Water Swimming Race on April 30, 2017 in Austin's Colorado River and came back to the Pasadena area with three Top Three finishes. 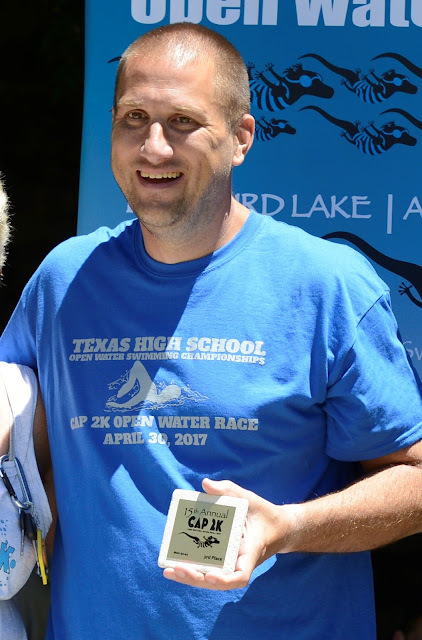 Derrick Mauk, competing in the men's 40-44-year-old age group placed third with the time of 33:11.01. the former nationally ranked high school diver and USA Masters Swimming National Championships Finalist was competing in his second Cap 2k. He first competed in the race in 2007, placing second in the men's 30-39-year-old division with the time of 35:18.56.
third inn his second-ever Cap 2K. 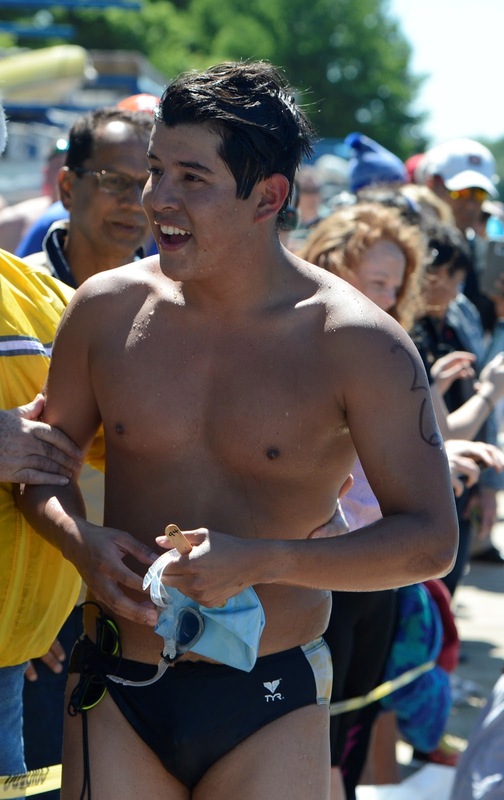 Pasadena Memorial students Tristan Morgan and Marco Castillo, who competed in the men's 18-24-year-old division, finished in second and third place, respectively. Morgam posted the time of 35:56.03 while Castillo was just under two minutes back at 37:45.07. Morgan previously competed in the race in 2015 and 2016 in the high school aged division, while Castillo also competed in 2016. In the boys 12-14-year-old division, Harrison Brown placed fourth in his first ever Cap 2K with the time of 36:44.30. His time was only 55 seconds behind third-place finisher Lane Stallworth (35:49.18). the starting line of the Cap 2K. (7th place, 41:40.61), Abigail Salazar (9th place, 42:36.20), Reanna Bowers (10th place, 44;20.02) and Christine Osborne (11th place, 47.07.79). Joining them in the Maverick's scoring was first-timer Kimberly Dutton (6th place, 39:34.82). Pasadena High School junior Alexa Perez placed eighth with the time of 42:12.21. Memorial scored 18 points for the runner-up in the team standings behind Westlake (27 points). Westside High School was third with seven points while Pasadena placed fourth with three points. In the boy's division, First Baptist Christan Academy's Christopher Brown finished in seventh place with the time of 37:49.41, followed by Sam Rayburn High School's Michael Vargas in eighth place (37:55.20). 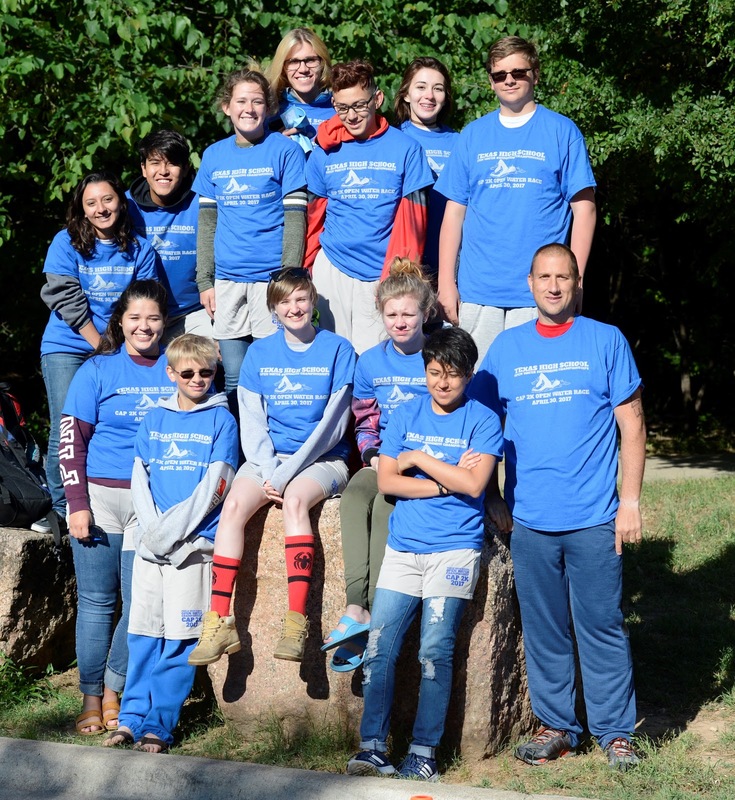 FBCA placed fifth in the team standings as a resullt of Brown's performance.